Clearly, I have no shame and no self-control. Not too long after I had the pleasure of talking live-action children's television with Pax and CT on the Nerd Lunch Podcast a few weeks ago, I stumbled across an interesting VHS tape at my local Goodwill. 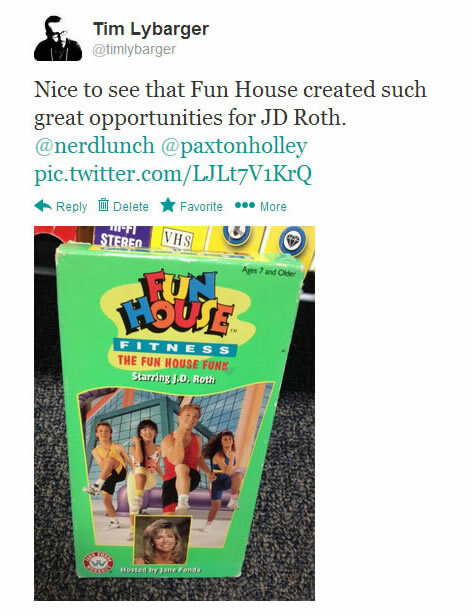 Since one of the shows we had discussed was Fun House, I snapped a picture of the box and popped off a quick tweet to the guys at Nerd Lunch. Most rational adults would have stopped there. For just over two weeks, I kept thinking about that stupid tape -- not because I wanted to learn the Fun House Funk from J.D. Roth, but for a measly buck, it would be worth seeing just how bad this video was. But I held out and saved a dollar. In case you're wondering, yes it's as bad as it looks...and yes, it was worth every cent of the $1.05 that it cost me. Upon further investigation, I was surprised to find that this video was a hot enough commodity that it was eventually released on DVD. Not only that, but there's even a second Fun House Fitness video out there. Uh oh. You know what that means. Swamp Stomp, here I come.